Make sure your CSV has the prospect details separated in columns for each field. Each column should have a header. Login to your Klenty account and go to Prospects – Add Prospects. 2. Under Import from CSV click to upload, or drag and drop the file you want to import. 3. Klenty will automatically map the column headers with prospect fields. Verify that your headers are mapped to the correct fields you want to use. 4. 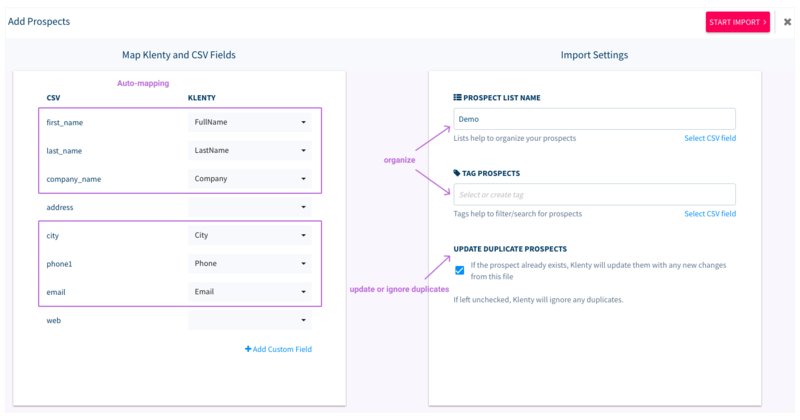 If you can’t find a prospect field to map your CSV columns to, you can create a custom field. 5. You can add prospects to a Tag or List here to categorise them in your Klenty database. You can create or choose from your existing tags/lists or use a column from your CSV file. 6. Enable Update Duplicates if you need to update prospects already added to your Klenty account. You can view the results of the import and schedule a cadence for the prospects you imported from the Import History.